This figure was shown me by the same young Bagobo who taught me the preceding Diamonds. He had no name for it. Second: Release the loops on the thumbs. 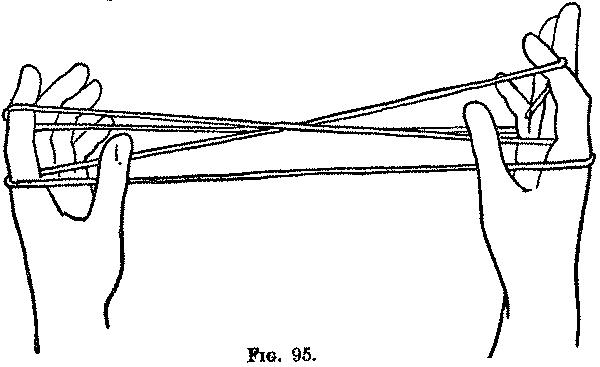 Third: Turning the palms away from you, bend each index away from you over the far index string, and pick up from below on the back of the finger the near little finger string; straighten the index and turn the palms facing each other (Fig. 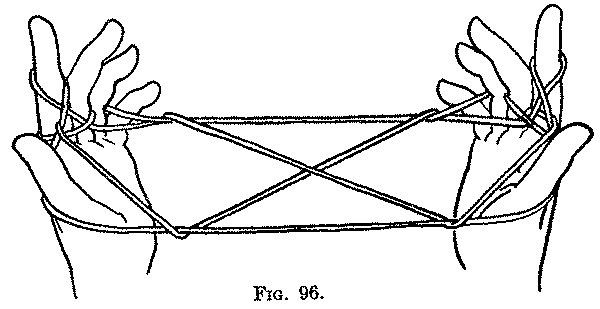 95, Right hand); then release the loop from each little finger (Fig. 95, Left hand) and draw the strings tight. You now have two loops on each index, an upper loop with a straight far string and a lower loop with a near straight string. The right lower far index string crosses on the near side of the left lower far index string; in the Bagobo Diamonds, the left lower near index string crosses on the near side of the right lower near index string. Fourth, Fifth, Sixth and Seventh: The same as the corresponding movements of the Bagobo Diamonds. The finished pattern appears on the completion of the Seventh movement (Fig. 96). This figure closely resembles the preceding figure, but in the Second and Third movements it is the little finger loops which are transferred to the index fingers. The final figure is symmetrical, and does not require any rotation of the hand to produce it.